Published on September 12, 2018 by Wolters Kluwer. The Fourth Edition of the Governmental Plans Answer Book has now been published! 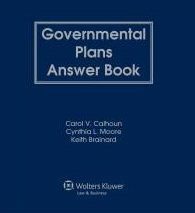 Governmental Plans Answer Book, Fourth Edition, provides in-depth coverage of these complex plans, which must satisfy federal laws as well as pension, investment, and other laws of the applicable state or local governments. It is the one resource that takes you step by step through all the aspects of plan administration and compliance in this demanding practice area. Governmental Plans Answer Book gives you the most relevant, current, and practice-oriented answers to the issues you face daily as you navigate the requirements and procedures involved in administering plans. 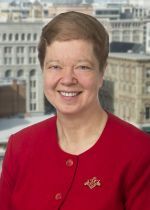 Carol V. Calhoun is counsel at Venable LLP, Washington, DC. A majority of her practice is the representation of state and local retirement systems and other governmental entities in the employee benefits area. She represents clients before the Internal Revenue Service, U.S. Department of Labor, and Pension Benefit Guaranty Corporation, as well as conducting ongoing counseling. She is the founder and editor of the Employee Benefits Legal Resource Site, https://www.benefitsattorney.com, a legal research source for employee benefits attorneys and other professionals. Ms. Calhoun is the author of a chapter in the 457 Answer Book, published by Aspen, and co-author of the legal analysis section of Tobacco Divestment and Fiduciary Responsibility, A Financial and Legal Analysis, published by the Investor Responsibility Research Center, as well as numerous articles on employee benefits law and insurance product taxation. Ms. Calhoun is a charter fellow of the American College of Employee Benefits Counsel. She was formerly a member of the Board of Editors of the Legal-Legislative-Regulatory Update section of Benefits Quarterly. She is a member of the American Bar Association Section of Taxation Employee Benefits Committee and formerly chaired its Subcommittees on Governmental Plans; 457, 403(b), and Exempt Organizations Issues; Government Submissions; and Distributions. She is a frequent speaker on employee benefits issues and is a member of the National Association of Public Pension Attorneys and the National Council on Teacher Retirement. Ms. Calhoun received her JD from the Georgetown University Law Center, where she was Associate Editor of The Tax Lawyer. She obtained her BA from The Johns Hopkins University, where she was selected for the Pi Sigma Alpha political science honor society and the Mayor’s Fellow program. Further information on Ms. Calhoun can be found in the latest edition of Marquis Who’s Who in America. Cynthia L. Moore is an attorney who specializes in issues affecting state and local government retirement systems. She served the National Council on Teacher Retirement (NCTR) as its Washington Counsel by advising NCTR members on federal legislative and regulatory issues that affect the operation of state and local government retirement systems. Ms. Moore has conducted many surveys on state laws affecting state and local government retirement systems, including those that serve teachers. The surveys cover fiduciary laws, governance, cost of living adjustments, pension portability, and benefit increases. She has made presentations on pension issues in 43 states and also in Europe to retirement administrators, legislators, governmental officials, active and retired employees, and labor officials. Before becoming a lawyer, Ms. Moore was a member of former Congressman Dan Glickman’s legislative staff for five years. She covered such diverse issues for him as health, tax, Social Security, and agriculture. She graduated from Case Western Reserve Law School in Cleveland, Ohio. She served as Notes Editor of the Law Review. She is a member of the bar of the Commonwealth of Virginia, the District of Columbia, and the United States Supreme Court. Keith Brainard is the research director for the National Association of State Retirement Administrators (NASRA) and, as such, collects, prepares, and distributes to NASRA members news, studies, and reports pertinent to public retirement system administration and policy. NASRA members are the directors and administrators of 82 statewide public retirement systems in the United States. Combined, these systems hold assets of more than $2 trillion in trust to fund pension and other benefits for most of the 22 million working and retired employees of state and local governments in the United States. Mr. Brainard is the author of the NASRA white paper “Myths & Misperceptions of Defined Benefit and Defined Contribution Plans,” and co-author of a 2004 Pension Research Council working paper, “Profitable Prudence: The Case for Public Defined Benefit Plans,” which describes the economic effects of public employee pension plans. He also maintains the Public Fund Survey, an online compendium of public pension data sponsored jointly by NASRA and the National Council on Teacher Retirement. Mr. Brainard previously served as manager of budget and planning for the Arizona State Retirement System, and he provided fiscal research and analysis for the Texas and Arizona legislatures. He has a master’s degree from the University of Texas-Austin, Lyndon B. Johnson School of Public Affairs. He lives with his wife, Katie, and their children in Georgetown, Texas. What Is a Governmental Plan? Who May Make a Beneficiary Designation?